As highly experienced NYC & Long Island dental implants providers, the dentists of Advanced Periodontics & Implant Dentistry recognize the importance of an attractive smile. One or more missing teeth can cause functional problems, lead to further tooth loss, and lower the patient’s self-confidence and self-esteem. In order to resolve these concerns, our dentist offer several leading-edge dental implant procedures. In addition, they perform advanced gum surgery techniques for patients seeking the help of a skilled periodontist. Though traditional dentistry has given us many options for treating patients with missing teeth like bridges and partial or full dentures, dental implants are a proven solution for people in good overall oral and systemic health who have lost one tooth or have lost or are missing several teeth due to periodontal gum disease, trauma or injury, or any other reason. This is because dental implants are one of the most predictable and conservative ways of replacing missing teeth with the best long term success. Due to their unmatched stability and longevity, dental implants are by far the best and most stable long-term tooth replacement option. 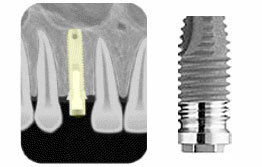 Dental Implants are basically artifical tooth roots that are placed directly into the jaw bone for maximum stability, and are used to support the teeth/crowns. They look, feel and funtion just like natural teeth, are not suceptible to decay, and can last a lifetime if they are properly cared for. >Dental implants are available in several different forms. The most common dental implants are called “root form implants”. Root form implants are similar to teeth in that they mimic roots of teeth. Our team of cosmetic dentists are extremely well trained and very experienced with dental implants. Our top implant specialists stay abreast of the very newest dental implant technologies, and no other dental center in the Long Island or Queens area of New York can surpass our expert technique.